We were supposed to ride on Saturday. The previous weekend was brilliant for weather and we spent all of it in the garden or around the house. We didn’t get on the bike once. This weekend we were going to ride, ride, ride to make up for lost time. What did we wake up to? Wind and lashing rain. We decided to take Lady CoMo apart. Literally. To break her up into pieces. And then put her back together again. Just for fun. Well, actually as a practice run for our vacation in September. Co-Motion’s instruction booklet is very specific. Get a chair, make yourself comfortable, and give yourself lots of time. We could handle that – we had a whole day of lousy weather ahead of us. There are three basic steps to taking her apart: remove the timing chain, undo the cable splitters, and loosen the couplings. It’s dead simple. 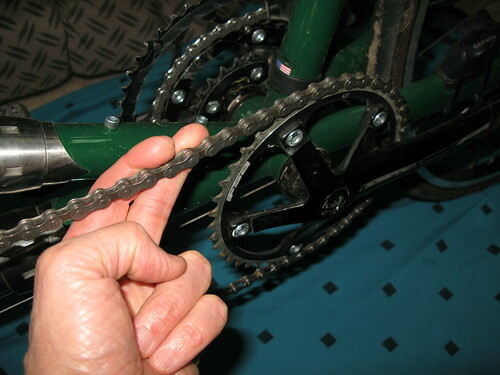 Removing the timing chain is a simple matter of pulling the chain sideways while rotating the crank arms. The chain slips right off. 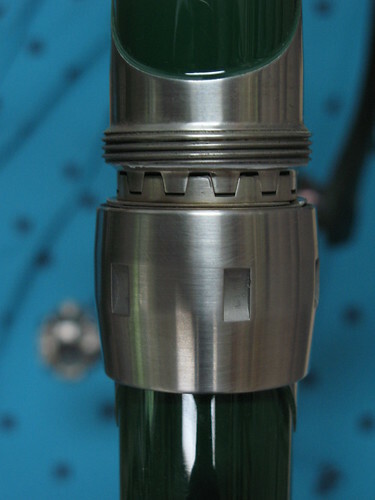 However, Lady CoMo also comes with an eccentric hub which can be loosened and rotated to alter the tension on the chain. I wouldn’t have noticed this except it was mentioned in the instruction manual. Pete Stasney at Co-Motion explained that the eccentric hub is only needed if you have a belt drive rather than a chain. So no eccentricities for us. 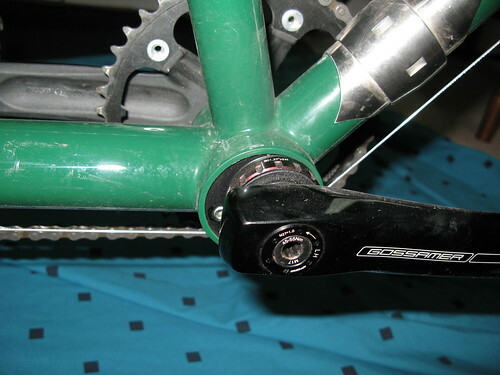 Cable splitters are installed on the derailleur and rear brake cables. There are three of them. I released all tension on both derailleurs (so the bike was cross-chained). I then used two spanners to loosen the cable splitters and unscrewed them by hand. No difficulty here. Oh, I also made a mental note of which cable went where. Finally the moment of truth. It was time to decouple. A handy wrench supplied by Co-Motion is the only tool required. Each coupling was loosened slightly and then unscrewed by hand, one by one. 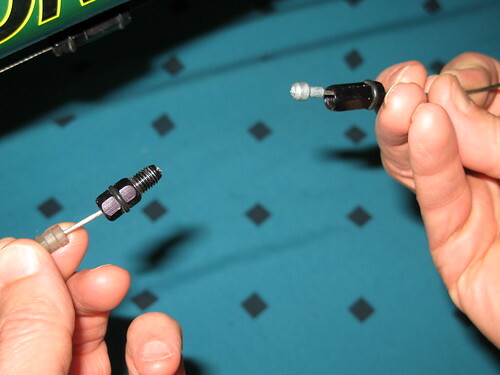 The most difficult part of the operation is holding the frame in place while taking it apart. Once the frame was in pieces it was an opportunity to give her a good washing and an application of Pink Carnauba wax. When we bought Lady CoMo we got everything we would need for travel. After all, our intention is to tour with her. 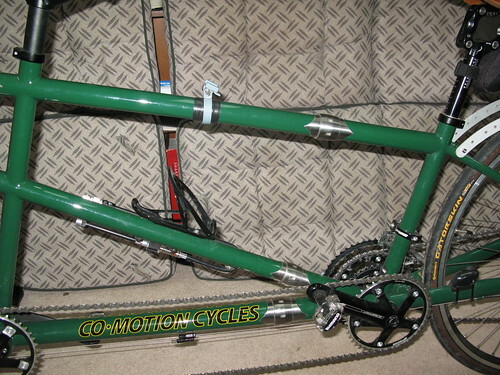 Co-Motion supplied Velcro sleeves to protect the frame. This was the opportunity to measure, cut and label them. In principle, all we need to do is remove the handlebars, seat posts, and pedals in order to fit Lady CoMo into these two luggage-sized suitcases. They are standard size for airport check-in so hopefully we avoid outrageous bike fees in future. Reassembly was best done while the memory was fresh. We regreased the couplings with Teflon grease and carefully reversed our steps. It was actually surprising how quickly everything went together. The only question was, did we do it properly? Well, Sunday dawned clear so we packed ourselves up and went over to Gatineau Park. We rode an alternate route that included a five kilometer climb past Lac Fortune. 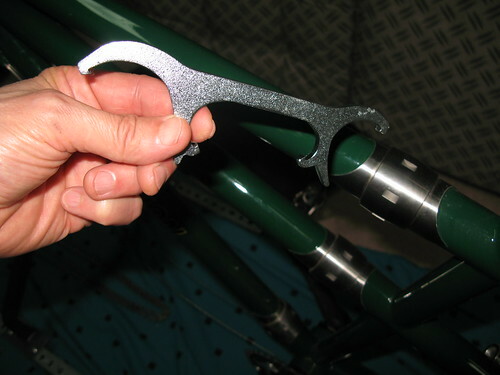 The gears shifted smoothly, the brakes were perfect, and the frame stayed in one piece. I think we can call the operation a success. Posted by Kern on June 5th, 2012. I've never seen those couplings "in the flesh" like that. 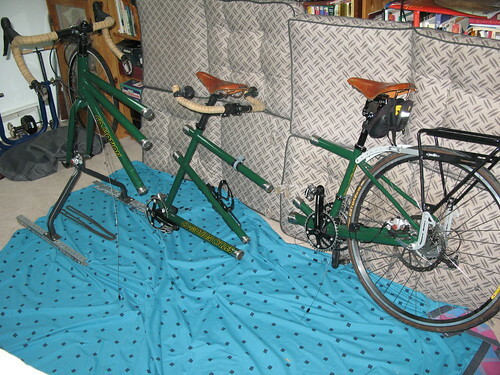 Brilliant idea to have those on a bike, let alone a tandem. Thanks Kern for a very interesting story. Seems to work well Kern, especially if the whole bike will pack away into the two suitcases. I'd be interested to see how this goes – all packed up. Even with the sleeves, a few sponges may help keep things from rubbing against each other in transit. I would also carry a spare cable splitter on tour, and some of the little set screws (if that is how the cut end of the cable is secured). Yes, fascinating. Those pictures of the tandem in 3 bits are amazing, I can't believe you can pack a tandem into 2 bags and put it on a plane! Until I read about your Lady Co-Motion I wouldn't have thought it possible for coupling devices to cope with the torque generated by two cyclists. Very clever stuff. I've been staring at a larger size image of your "Coupler Decoupled" photograph for ages. I daren't trust my memory these days for when it comes to reassembly. I think I'd have to take photographs to job my memory. 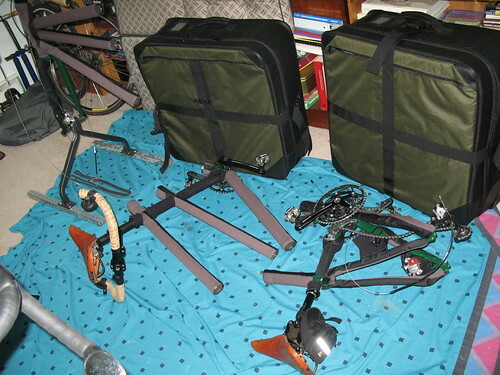 Yes, supposedly the tandem will fit in those two suitcases. We bought them with the bike from Co-Motion, and based on their track record I fully expect it will fit. There are no foam cut-outs though. No sniper rifles either 🙂 . The velcro sleeves are made of a stretchy foam material. 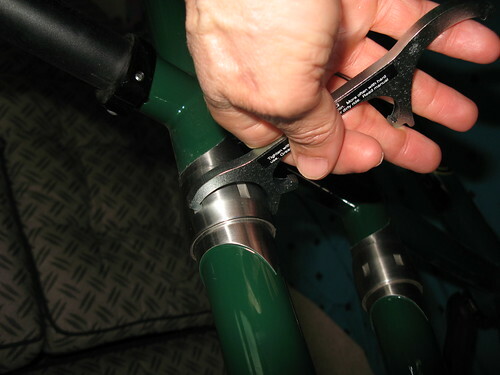 They separate lengthwise and wrap around the frame components. I think you're supposed to stuff the suitcase with clothing etc for padding – we haven't got that far yet. I don't think Co-Motion make the couplers themselves. Being Seattle-based it wouldn't be surprising if the couplers are based on airplane component technology. If so it's a good example of leveraging local knowledge. We'll let you know how the packing goes after our trip in September. The suitcases look huge. I can't see a problem there. Did you fix on a place to go touring yet Kern? Hi Patrick. We're going to try the Spanish side of the Pyrenees starting from Girona and heading west. If things get too rough we can always drop down to the plains and drink wine instead 🙂 .